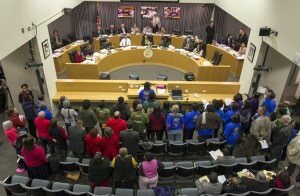 The agenda for today’s School Board meeting is packed with hot-topic resolutions, including a plan to streamline LAUSD’s teacher misconduct investigation process, a call to work with state legislators to pass a new teacher dismissal bill, and a plan to reduce student suspensions and discipline for “willful defiance” in LA schools. These topics have received scads of media coverage and statehouse activity in recent months. LAUSD Board members have obviously been paying attention, and the media is getting behind their resolutions. Board Member Tamar Galatzan penned an op-ed published Monday in the Huffington Post that explains the rationale behind her resolution to streamline investigations of teachers who have been accused of misconduct in the classroom. Read on for more details on the resolutions up for vote at today’s School Board meeting. LA School Report detailed last Tuesday how the resolution is an attempt to reduce the number of LAUSD teachers who wait with full pay in “teacher jails” while the district goes through a lengthy — and costly — investigation process. Board Member Bennett Kayser, who frequently sides with the teachers union, has signed on as a cosponsor of the resolution, along with Board President Monica Garcia. It’s rare when these three Board members agree with each other, so enjoy it while you can. Kayser and Galatzan have joined forces on another resolution voicing approval for AB 375, the new teacher dismissal bill that is working its way through the State Assembly thanks to unexpected backing from the California Teachers Association and Senator Alex Padilla. As we reported, some education advocacy groups have expressed concerns that AB 375 won’t be effective enough when dealing with teachers accused of sexually or physically abusing their students. But a recent LA Times editorial says it’s a good proposal, and Galatzan and Kayser want Superintendent John Deasy to work with the bill’s author, Joan Buchanan, to make it happen. Moving from teacher-related issues to student discipline, Board President Monica Garcia has a resolution to update discipline codes in schools across LAUSD to mirror state-level efforts to reduce student suspensions and limit gaps in disciplinary proceedings among different groups of students. Kayser will be a busy Board member this meeting: His postponed resolution that would create new rules for magnet schools and their approval process is back up for a vote. (Read about the magnet resolution here.) Kayser’s attempt to bar School Board members who received financial support from charters from voting on charter-related motions will be back up for discussion as well. Also up for vote on the agenda are several charter renewals and proposals for new charter and pilot schools. Click here to see the full Board meeting agenda, and remember to follow us at @laschoolreport for live coverage of the meeting.